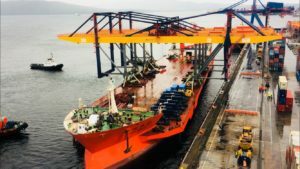 On 1 October 2018, Vladivostok Sea Commercial Port (VSCP) received two new Rail Mounted Gantry (RMG) cranes for its container terminal, informs the port’s press service. The cranes were acquired within the investment program of modernisation of the port’s operational facilities and are scheduled to be put into operation on 24 December 2018. VSCP is located on the Russian Far East coast and is part of FESCO Transportation Group, the leading Russian infrastructure and logistics holding company. The RMG cranes are manufactured by Shanghai Zhenhua Heavy Industries Co Ltd (ZPMC) and have the SWL of 45 tons and the gantry span of 63m, which allows them to handle 28 rows of containers stacked 5-high. The operational capacity of both machines allows for up to 840 movements per day, that will enhance the terminal’s yard capability by 15-20%. The RMGs were delivered to Vladivostok by a specialized vessel from Shanghai. To facilitate the unloading process, the VSCP engineers, together with the colleagues from ZPMC, are constructing temporary rail tracks at the quay area. The specialized vessel will then take in water in the ballast tanks and submerse down to the level of the terminal’s quay wall, so that the cranes could be moved to the territory of the terminal. The unloading operation is scheduled on 5 October for the first RMG and on 12 October for the second one. After the RMGs are mounted on the permanent rail tracks, the ZPMC engineers will start their commissioning, which will last till 24 December. The port informs that these works will not affect its normal operations. The ZPMC cranes will complement the 4 RMGs that are currently operating at the VSCP container terminal. In total, the terminal’s yard is equipped with 16 cranes of various types, which carry out over 6,400 container movements daily. In January-August 2018, VSCP handled 342,500 TEU, which represents an increase of 16% as compared to the same period of last year.